Butler forward Julia Gibson (31) powers around Seneca Valley defender Maddie Karchut during the Golden Tornado's 36-35 victory. JACKSON TWP — When he watches film of his team's Section 1 finale with Seneca Valley, Butler girls basketball coach Mark Maier will see things his players can correct as the WPIAL playoffs loom. The final 18 seconds, however, went according to script. The Golden Tornado trailed the host Raiders, 35-34, when Julia Gibson rebounded a missed free throw by SV's Haley Cramer. Two passes got the ball to Alyssa Eyth, whose layup at the other end with eight seconds remaining was the difference in a 36-35 Butler win, which secures for the Golden Tornado (11-8, 6-4) second place in the section. Butler had trouble on the glass for much of the night — and was getting beat there 17-3 at one point late in the first half — but Gibson's determination yielded the biggest board of the game. SV had a chance to win the game before the buzzer, but Gretchen Koken's shot from the left wing bounced off the front of the rim. The Tornado held a tenuous 28-26 lead entering the fourth. The lead changed hands three times, the final instance coming when Koken forced a Butler turnover and Gross banked in two points for the 35-34 lead with 1:40 left in the game. At halftime, Maier stressed the importance of rebounds. Despite being dominated on the boards, the Tornado trailed just 16-13 at the break. “I knew if we could seal up more rebounds, we could win the game,” said Maier. “Seneca Valley is a big, strong team, but so are we. They were slicing our man defense in the first half, so we switched to a 3-2 zone. I think that helped us get more boards. “In the end, we just made one more play than they did,” he added. The Raiders committed 16 turnovers, 14 of them coming in the first three quarters. They shot just 50 percent (9-of-18) from the free throw line. 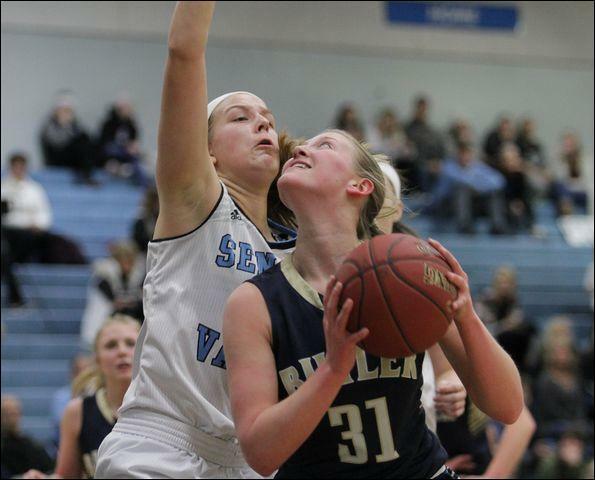 Jenna Kunst added 10 points for Butler while Gross led the Raiders with 13 points. Maddie Karchut had eight rebounds. Seneca Valley (11-9, 5-5) will enter the playoffs as the third-place team from the section. Both teams have a non-section game this week. Seneca Valley travels to Central Valley Wednesday. Butler hosts St. Joseph on Thursday. Nicole Pepmeyer 2 0-0 4, Mia Rader 0 2-2 2, Alyssa Eyth 5 2-4 14, Jenna Kunst 5 0-0 10, Julia Gibson 1 1-1 3, Emilee Altman 1 0-0 3, Emma Monteleone 0 0-0 0, Jordan Kauffman 0 0-0 0, Sydney Hanratty 0 0-0 0. Totals: 14 5-7 36. Karlie Martin 2 1-2 5, McKenna Gross 4 5-6 13, Gretchen Koken 3 1-3 7, Haley Cramer 1 0-2 2, Madelyn Karchut 3 2-5 8, Cheyenne Andres 0 0-0 0, Lexi Peffer 0 0-0 0, Jaden Davinsizer 0 0-0 0. Totals: 13 9-18 35.